Images are for illustrative purposes only. Actual product may differ. Astrum GP110 Gamepad - PC - DIGITAL TURBO/CLEAR - USB Copyright © 2019 ComXpert International CC - COPYING IS ONLY ALLOWED FOR THE PURPOSE OF SENDING US ENQUIRIES. E&OE. © Respective owners and brand holders. © 2019 ComXpert International CC. The contents has been generated by ComXpert International CC (//www.comx-computers.co.za). All products are sourced locally in South Africa and the warranty is that of the local supplier only. E&OE. Important notice The information displayed below this paragraph is for reference purposes only. The information may be generic in nature, which covers the entire range of products that fall within this category, and might not apply to this specific model. Please select the correct model as per the above description. Kindly note that additional software, such as anti-virus and office software, are trial versions and a license will need to be purchased to use the software without limitations. © 2015 Respective owners and brand holders. This table has been carefully researched and generated by ComXpert International CC (//www.comx-computers.co.za), however, errors and omissions may occur. Only references to South Africa apply. All products are sourced in South Africa from the official suppliers and the warranty is that of the local supplier. E&OE. This table and our site's content may be used on condition that this notice and link remains intact and unaltered. , ©2015 ComXpert International CC Copyright © 2019 ComXpert International CC - COPYING IS ONLY ALLOWED FOR THE PURPOSE OF SENDING US ENQUIRIES. E&OE. Reviews have been submitted by users and do not necessarily reflect our own opinion. The best price and guaranteed service and backup from official computer suppliers in South Africa for the A71511-B Astrum GP110 Gamepad - PC - DIGITAL TURBO/CLEAR - USB. 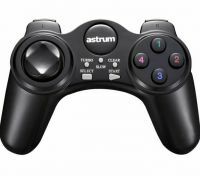 The Astrum A71511-B Astrum GP110 Gamepad - PC - DIGITAL TURBO/CLEAR - USB is available for R114. The product is sold by ComX Computers as new. Prices are valid today 2019-04-22 (before 2019-04-23 , by quote, while stocks last). The product is expected to be in stock, although this is not guaranteed. Available from this online computer store delivering door-to-door in Johannesburg, Cape Town, Port Elizabeth, Pretoria, Pietermaritzburg, Polokwane, Durban and all over South Africa. Find related A71511-B Astrum GP110 Gamepad - PC - DIGITAL TURBO/CLEAR - USB products in our Game hardware Category for even more options. Read reviews and find out about A71511-B Astrum GP110 Gamepad - PC - DIGITAL TURBO/CLEAR - USB. Discounts, specials and cheap prices only at ComX Computers.